I briefly met Gerald James once at a meeting of MOJO, the group organised by former Birmingham Six member Paddy Hill. It was an incongruous setting in which to come across a former paratrooper and successful city accountant, but James had a fascinating tale to tell, the bones of the story which is told more fully in this book. As a former member of the Monday Club, and friend of MI6's George Kennedy Young, James was by his own admission part of the Tory clique that brought Thatcher to power, the very group that would bring down his company ten years later. "On the face of it," he writes, "this is the great irony of my story." In 1981, James became chairman of Astra Fireworks, which he planned to turn into a major arms manufacturer. This strategy chimed perfectly with the increased militarisation of the British economy under Thatcher. James' insight into the nature of that economy is one of the biggest strengths of the book. "The illicit arms trade of the 1980s was no less than the 'magic' at the heart of the Margaret Thatcher's economic miracle," he writes. Much of the arms from several of these deals actually ended up with the combatants in the Iran-Iraq War. In many cases the arms were never paid for, but the flow of North Sea oil revenue, in the form of export credits for failed deals, acted as a major subsidy to the city. 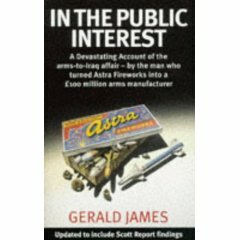 James believes that after the 1988 Iran-Iraq ceasefire, the British Government sought to protect the largest British arms manufacturers from exposure by implementing a damage limitation strategy that would sacrifice some of the smaller players. James' efforts to protect Astra's interests brought him into conflict with Stephan Kock, a director of the company who James claims was working for MI6, which wanted to continue using Astra for covert deals. James was ousted in a boardroom struggle in March 1990. Chief Executive Chris Gumbley resigned shortly afterwards. Gumbley then travelled to Brussels to meet Iraqi supergun designer Gerald Bull, in an attempt to secure evidence that Astra was being victimised. Bull was assassinated an hour after the meeting. Gumbley was later sentenced to nine months in prison for corruption. Ironically, during the Gulf War, James' son Christian was to be one of the many British soldiers who would come across British ammunition in the hands of Iraqi forces. The book features walk-on parts for Jonathen Aitken, a director of Astra subsidiary BMARC, and Mark Thatcher, who appears as an associate of the so-called 'Savoy Mafia' of arms dealers. It is a remarkable story that goes to heart of how Thatcher reshaped Britain and its place in the world with consequences that are still unfolding.